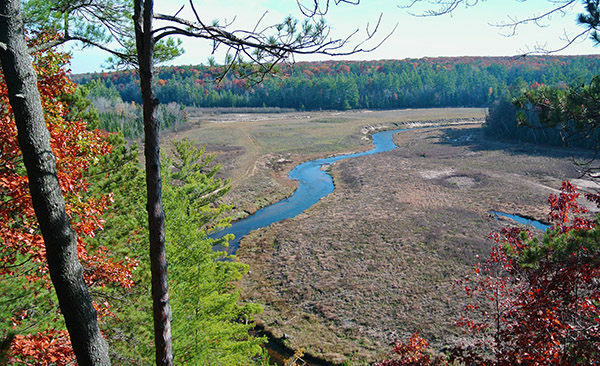 Brown Bridge Quiet Area is a 1,310-acre preserve located 11 miles southeast of Traverse City and is the result of two monumental events; the year they built the Brown Bridge Dam and the year they removed it. 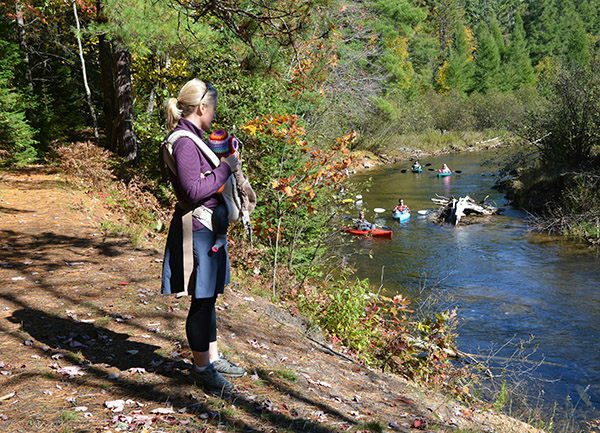 Today the Brown Bridge Quiet Area is one of the region’s largest and most diverse natural areas where visitors can wander 8 miles of trails through forests of white and red pine, paper birch, red maple and white cedar while often gazing over a blue-ribbon trout stream through the trees. Brown Bridge Quiet Area is a 1,310-acre preserve located 11 miles southeast of Traverse City and is the result of two monumental events; the year they built the Brown Bridge Dam and the year they removed it. When the Boardman River was dammed in 1922 the City of Traverse City purchased the land surrounding the new impoundment called Brown Bridge Pond. The 150-acre reservoir and the forested bluffs that enclosed it remained an obscured city parcel until the 1980s when waves of ORVers tore up the fragile terrain and seriously eroded the high banks along the north side. City officials and local conservation groups immediately began plotting a new future for the area. The first thing they did was post signs that read Brown Bridge QUIET Area, marking the boundaries of a preserve intended for quiet recreation. No camping, no motorized activity, no mountain bikes. In 2005, Traverse City Light and Power determined it was no longer cost-effective to produce hydropower at the Sabin, Boardman and Brown Bridge dams, prompting the dam owners – Traverse City and Grand Traverse County – to recommend removing the structures. Brown Bridge Dam was the first to be dismantled, setting in motion the largest dam removal and river restoration project in the history of Michigan. By 2012 the pond was gone and for the first time in almost a century 2.8 miles of the Boardman River, a state designated Natural River, reappeared. Today the Brown Bridge Quiet Area is one of the region’s largest and most diverse natural areas where visitors can wander through forests of white and red pine, paper birch, red maple and white cedar while often gazing over a blue-ribbon trout stream through the trees. A variety of wildlife, ranging from blue herons, bald eagles and ospreys to white-tailed deer, river otters, beavers, even an occasional black bear, have been encountered in the preserve. The Quiet Area features more than 8 miles of trails through mostly upland and lowland forests. The trail system is divided into four sections. Northeast Trail and Northwest Trail are on the north side of the Boardman River and covered as two separate hikes; South Trail and Grasshopper Creek Loop on the south side are described as one. In the winter Nordic skiers and snowshoers arrive at the Quiet Area with the Northwest Trail best suited for backcountry skiing. Note: In 2017 a foot bridge was built across the Boardman River to connect the Northeast Trail with the South Trail. In 2018 a second bridge was slated to be built across the river to connected the Northeast Trail with the canoe launch at the west end of the Quiet Area. Contact the Grand Traverse Conservation District for the status of each bridge. The Northwest Trail is a popular 2.3-mile loop in the Brown Bridge Quiet Area beginning from the West Trailhead on Ranch Rudolph Road. From the parking lot it’s a few steps to post No. 9 where you head west (right) to immediately reach post No. 10. At this junction take the left-hand fork to follow a wide trail that gently descends down the bluff, reaching the West Overlook in a quarter mile. The deck, equipped with benches, provides a view of the valley below with the Boardman River snaking its way through it. Post No. 11 is reached at Mile 0.3 and marks where a spur descends to the river. The main trail heads right to continue descending along the bluff until a massive stairway leads you down to post No. 12 at Mile 0.7. Continue south (left) to follow the earthen level that enclosed the west end of Brown Bridge Pond, passing post No.13 along the way. The trail reaches the site of the former Brown Bridge Dam, where now the Boardman River flows through uninterrupted, then swings north and at post No. 14 heads west on an old two-track to reach post No. 15 at Mile 1.2. The junction is where the Boardman River Trail arrives from the south and merges into Brown Bridge Quiet Area. 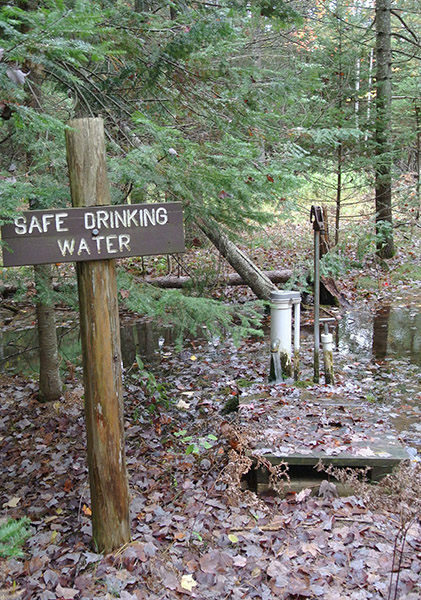 Head north (right) along a trail that uses three boardwalks through a low-lying wet area and a short stairway to reach post No. 16, marking a junction with the crossover trail from post No. 12. To remain on the perimeter of the loop follow the left-hand fork as the trail makes a long ascent – sometimes steeply – back to the top of the river bluffs. Old two tracks merge in from the left, at times to the right you can spot the trail that you followed in the first half. Within a third of a mile you top off on the bluff and then at Mile 2.25 return to post No. 10. The trailhead is just a few yards away. This 2.9-mile hike along the Northeast Trail begins at the East Trailhead on Ranch Rudolph Road where a path departs the parking area and immediately reaches post No. 8. The post marks a long stairway to the Boardman River and the bottomland trail. Head east to stay on the bluff and the wide, level trail will lead to the East Overlook viewing deck and then post No. 6, reached at Mile 0.3 and situated at the top of a massive stairway. The stairway is long enough – 231 steps to be exact – that halfway down there’s a bench built into it. You descend to a junction on the valley floor where you continue on the posted Boardwalk River Trail, more than 900 feet of planking that keeps your boots out of the forested wetland. 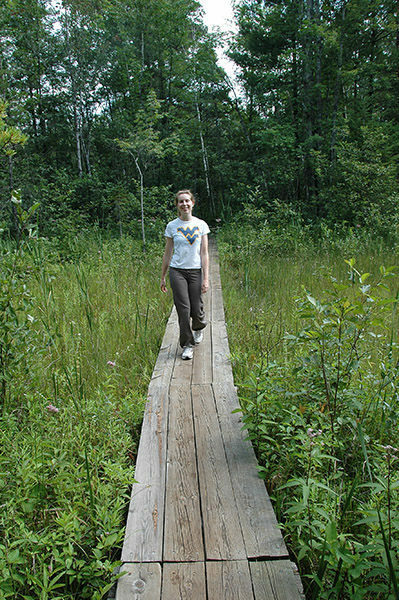 The boardwalk leads to the River Trail that heads east, skirting the banks above the Boardman River. It ends at post No. 5, reached at Mile 1.3, a scenic and very quiet spot where a bench overlooks a sharp bend in the river. Backtrack to Boardwalk River Trail but this time skip the planking and follow the trail that heads west (left) out into the open bottomlands. The trail skirts the Boardman River through what was just a few years ago Brown Bridge Pond. 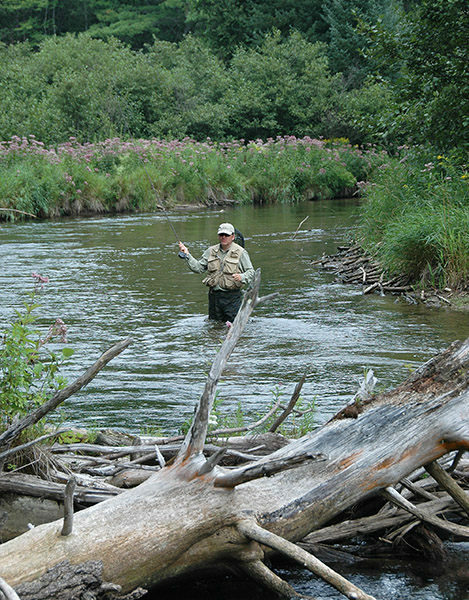 Before the dam, the bottomlands was heavily forested that kept the swift flowing Boardman River ideally cold for trout. Today this open area is in early stages of restoration that includes installing logs to improve fish habitat in the stream and planting native shrubs and trees to stabilize the banks and provide shade. The trail follows the river along a horseshoe bend before reaching a bench and junction near the stairway at Mile 2.5. Continue west (left) to skirt the base of the bluffs and arrive at the stairway from post No. 8 at Mile 2.8. You’re just one long climb away from the trailhead. These trails can be combined for 4.2-mile hike on the south side of the Quiet Area. 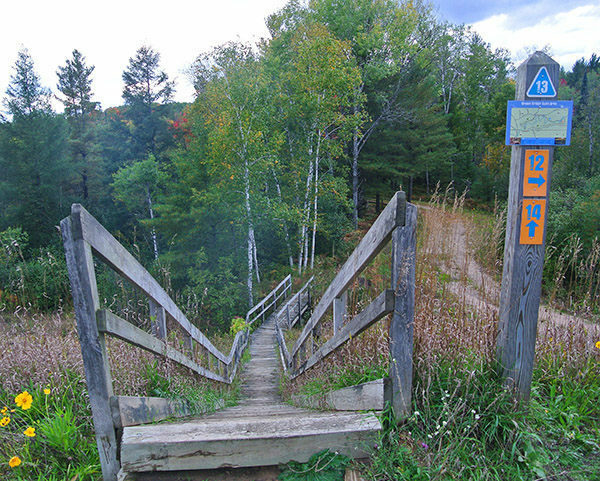 The main trailhead, reached from Brown Bridge Road, is in most developed area of the preserve, featuring a canoe launch, picnic tables, viewing deck and a vault toilet. You can also intersect the trails at two other trailheads along Brown Bridge Road, each with limited parking. South Trail begins at post No. 1 and heads east, following a low bluff that in the beginning provides views of the Boardman River through the trees. Eventually, the trail swings deeper into the woods and passes three unmarked paths that head south (right) a short distance to Brown Bridge Road. Just past Mile 1 the trail makes a steep descent off the bluff only to climb it again and arrive at post No. 2. Reached at Mile 1.2, the post marks the second trailhead that can be seen a short distance away on Brown Bridge Road. Continuing east the trail provides a glimpse of the Boardman River before making a steep descent and arriving at post No. 3 at Mile 1.6. The post marks the start of Grasshopper Creek Loop as well as a short spur from another trailhead along Brown Bridge Road. Grasshopper Creek Loop is a mile-long loop that if followed in a counter clockwise direction stays on the ridge for 0.3 mile before making a long descent to the valley floor, bottoming out at a boardwalk through a cedar swamp. From the cedar swamp the trail moves into a grassy meadow to arrive at post No. 4 at Mile 2.2. 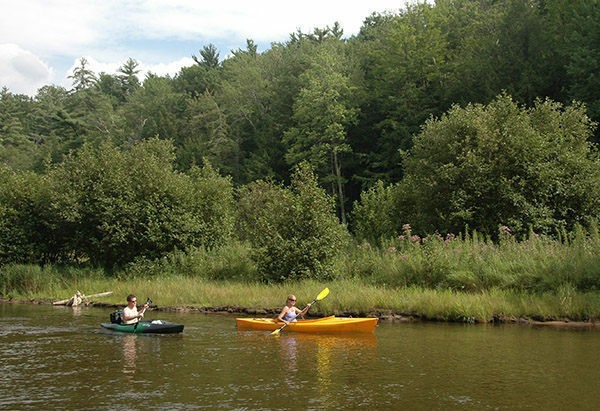 Head west (left) to quickly reach the Boardman River. The next stretch is scenic as the trail skirts the river for almost a quarter mile, passing a natural spring along the way that’s been piped so you can fill your water bottle. You then cross Grasshopper Creek via a foot bridge and finish off the loop with a steep climb back to post No. 3 reached at Mile 2.6. At this point you have a choice on how to finish the outing. Either backtrack the South Trail, a 1.6-mile walk to the main trailhead, or follow Brown Bridge Road west. It’s a 1.8-mile trek along the dirt road to the post No. 1, all of it in the forest. 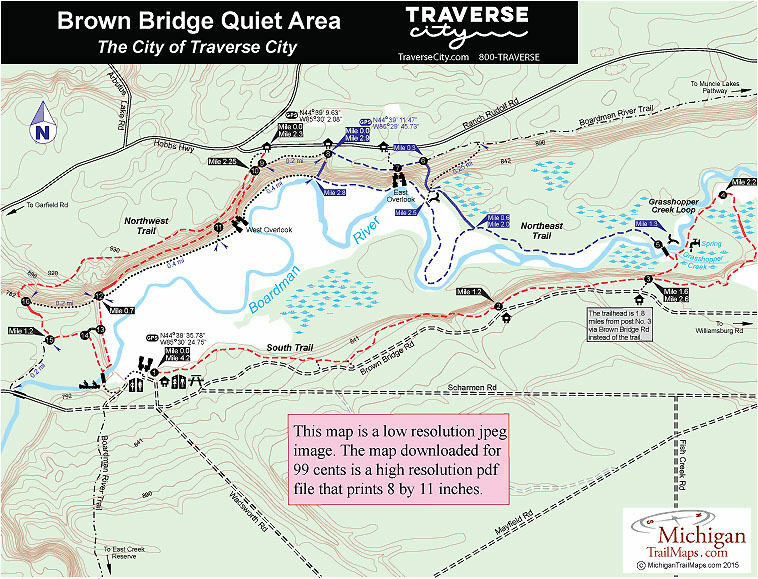 There are six main trailhead to Brown Bridge Quiet Area. Three are posted along Ranch Rudolf Road, three along Brown Bridge Road and all provide parking. The most developed portion of the preserve is the trailhead on Brown Bridge Road with post No. 1 and featuring a canoe launch, picnic tables, viewing deck and a vault toilet. The Brown Bridge Quiet Area is open year-round but the trails are not groomed for cross-country skiing. There are no fees to use the trails. From US-31 at Traverse City State Park, head south on Three Mile Road until it merges onto Garfield Road (County Road 611). Continue south on Garfield where signs will direct you to either the north side of the impoundment along Ranch Rudolf Road or the south side along Brown Bridge Road.